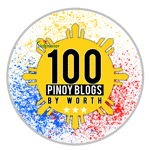 One week after Valentine’s Day, Makati gets rough, rugged, and revolutionary and it’s all thanks to the Philippines’ premiere and only professional wrestling promotion, Philippine Wrestling Revolution. How you ask? 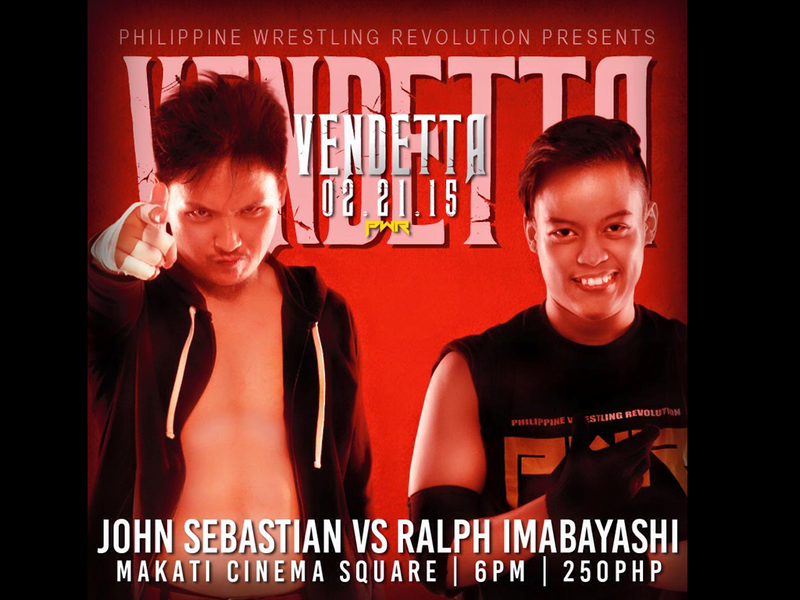 It’s because on February 21, 2015 at the Makati Square Arena in Makati Cinema Square, PWR presents their first show for the year 2015, PWR Vendetta! At PWR Vendetta, the star athletes of PWR are out to put on a show unlike any other featuring new PWR superstars, new match stipulations, contendership matches for the incoming PWR championship, and a rivalry full of hatred, revenge, and chaos that is an absolute fit to the show’s name. 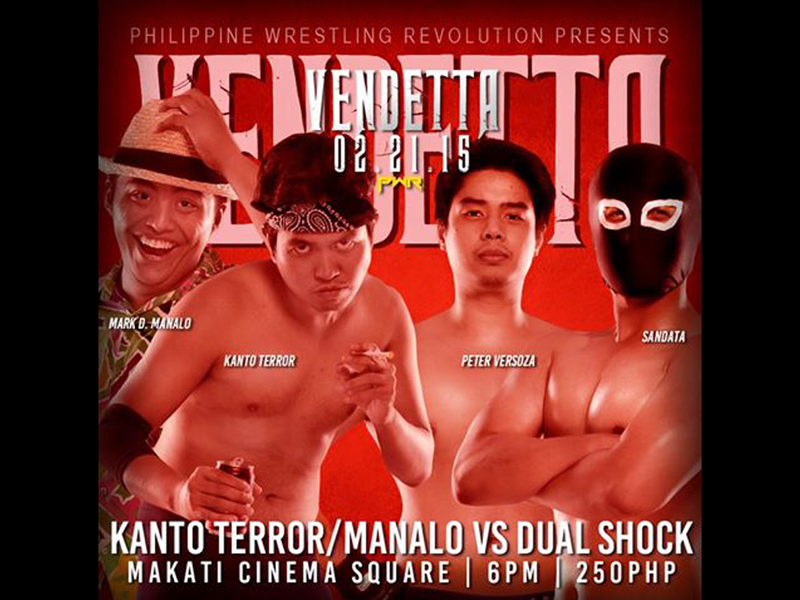 PWR’s resident siga and the protector of Kanto Tinio Street, Kanto Terror, will be bringing along his colorful Batangueno protege from PWR Terminus, Mark D. Manalo, into battle against the superbly athletic Peter Versoza and the technically-skilled Sandata, otherwise known as Dual Shock. Will the alcoholic PWR veteran and his promdi student be able get their first win as a tag team or will this new duo from the North and the South make an impact in their PWR debut? 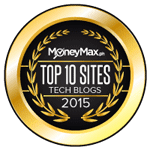 As two graduates of the PWR Bootcamp, John Sebastian and Ralph Imabayashi have proven themselves after months and months of hard training as two of the best in their class. 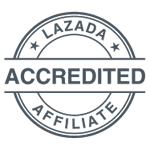 Now, they will face each other on PWR Vendetta and they will get the chance to prove to everyone why they are the up-and-coming professional wrestling stars of Philippine Wrestling Revolution. 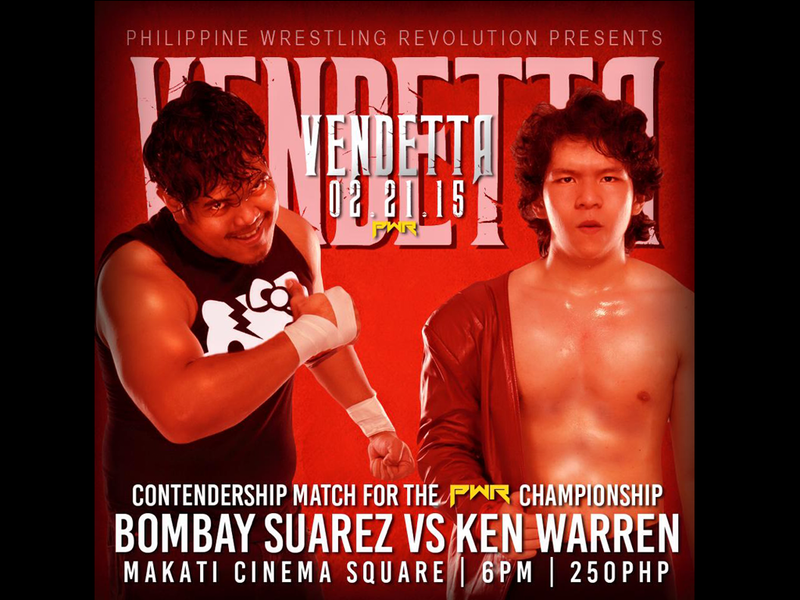 In the first of two championship contender matches in PWR Vendetta, PWR’s pioneer and number one badass, Bombay Suarez, takes on the Face of Facebook, the OG of IG, and Twitter’s Favorite, “The Social Media Sinister” Ken Warren. In this battle of clashing styles and personalities, will the rough and rugged brawling of Bombay come out on top, or will the flamboyant technical expertise of Ken Warren punch his ticket to a shot for the PWR Championship? 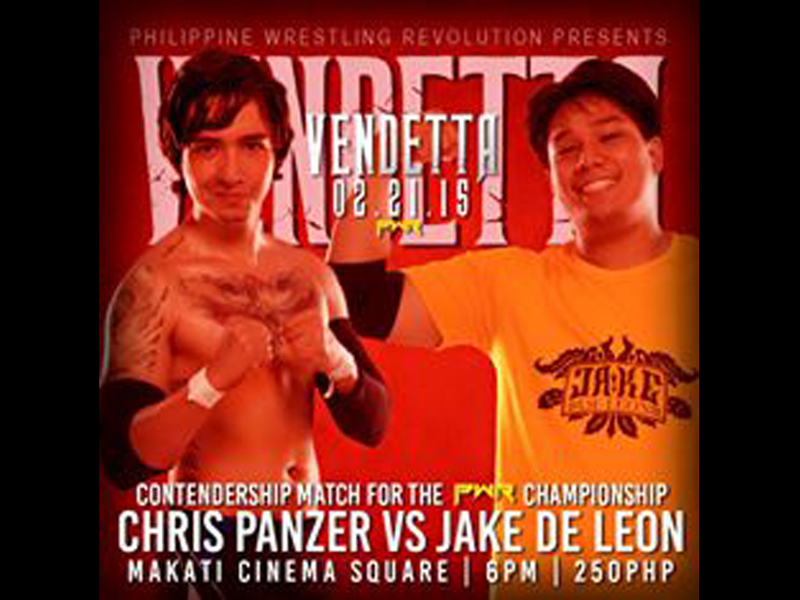 In the second championship contenders match in PWR Vendetta, two crowd favorites go head to head as the leader of the Panzer Army, Chris Panzer, takes on the primo haciendero of PWR, “The Senyorito” Jake De Leon. In this match, both wrestlers will undoubtedly throw everything at each other with neither refusing to give up. In this match, the hardwork and dedication, and heart of both competitors will be put on display. In this match, it will come down to who ultimately wants that shot for the PWR championship the most. Will we see the triumph of Minimum Wage & Maximum Rage or will Panzermonium take over? Rivalries heat up and ultimately come to blows as the Royal Flush, comprised of “Classical” Bryan Leo & Main Maxx, take on Mayhem Brannigan & The Apocalypse in PWR’s own diabolic creation, “The All Out War Tag Team Match.” In this tag team match, there will be no count outs, no rope breaks, and no disqualifications. The only way for a tag team to win is if one of the members successfully pins or submits an opponent, and did we almost forget to mention that pinfalls and submissions count anywhere? In what is set to be PWR’s most chaotic matchup so far, will The Royal Flush get their revenge on Mayhem Brannigan & Apocalypse for what transpired in PWR Terminus? 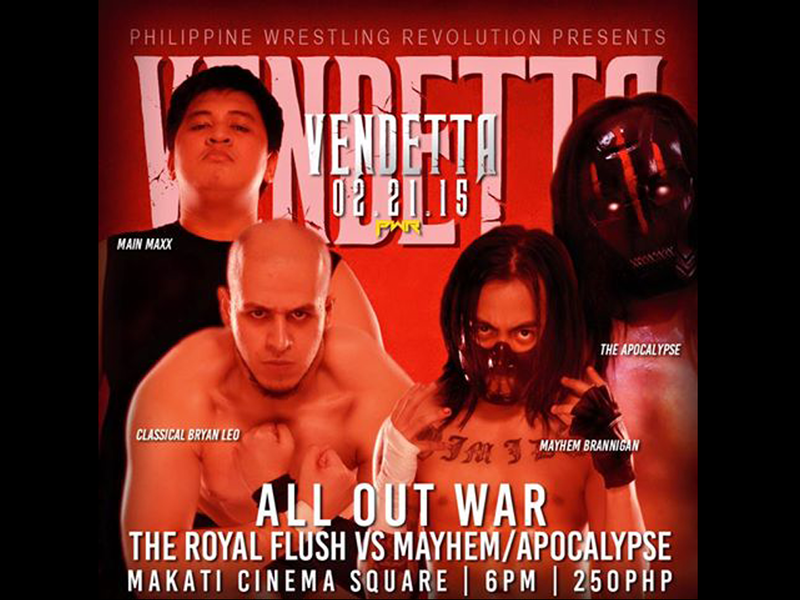 If one thing’s for sure, it’s that PWR Vendetta will be ALL OUT WAR! 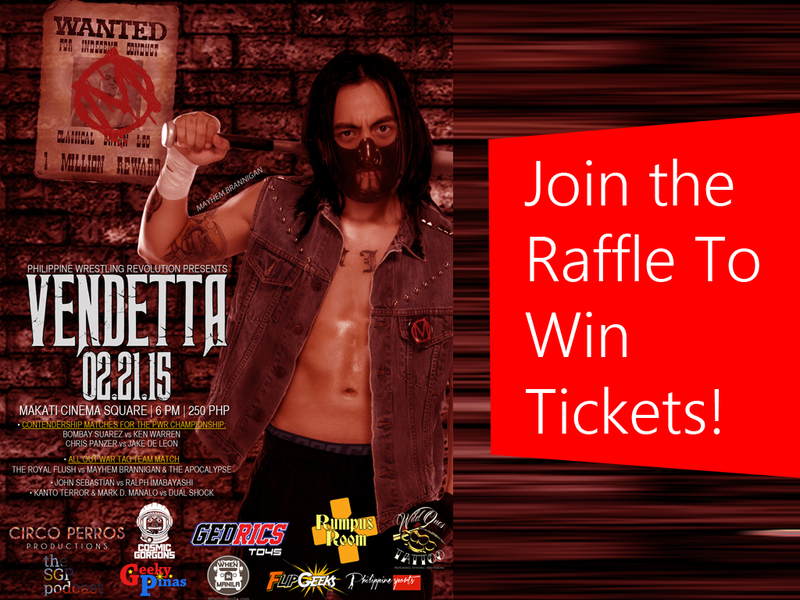 Witness all of these great matches and experience home-grown Philippine professional wrestling at PWR Vendetta on February 21, 2015, 6:00PM, at the Makati Square Arena in Makati Cinema Square. We are the revolution.